Real estate professionals will tell you there just aren't enough homes to meet demand. Buyers are frustrated at the lack of choices as inventory levels seem to fall each month. There may be several reasons for this but Realtors have long complained that builders aren't putting up enough new homes. The pace of homebuilding is about half of what it was during the housing bubble. But there may be a bigger problem, and one that will be more difficult to overcome. The evidence is contained in Wednesday's report showing a sharp decline in new home sales. Sales of new homes plunged 9.4% in July, down nearly 9% from the same month a year ago, while the inventory of unsold new homes went up slightly. But if there is a shortage of homes for sale, why aren't frustrated buyers snapping up these new homes? Simple. They can't afford them. The new home sales report shows the median sale price of a new home in July was $313,700 -- up more than $2,000 from June and a staggering $18,000 from July 2016. However, housing demand is being driven largely by first-time buyers, who must come up with a down payment and closing costs without the benefit of selling an existing property. Even with a 3.5% FHA down payment, a first-time buyer would need around $11,000 and an income to qualify for a $302,000 mortgage to purchase the median priced new home. In April, The New York Times reported the average first-time home buyer is 32 years old, earns $72,000 a year and -- this is the important part -- paid $182,500 for a home. This buyer is probably not a candidate for a new home costing more than $300,000. Why not build cheaper homes? So if the market is not for $300,000 homes, why are contractors building so many of them? 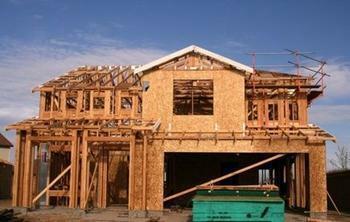 Why aren't they building more $182,000 homes? "Homebuilders are feeling slightly better about their business lately, but they continue to complain about the costs of land, labor, materials and regulation," writes Diana Olick, CNBC's real estate reporter. "They claim that is why they cannot build cheaper homes. Unfortunately, the lower end of the market is where most of the demand is and where supply is weakest." And since a large percentage of homebuilders are national, publicly-traded companies, there is pressure to increase profit margins to keep shareholders happy. The profit margin is much higher on a $300,000 home than a $180,000 home. So that leaves most first-time homebuyers competing for the shrinking inventory of existing homes, where prices are significantly cheaper. But sales of existing homes also fell in July, mainly because of a lack of inventory. The supply of homes was down 9% from a year ago. And in bad news for first-time buyers, the median price of an existing home was $258,300, up over 6% from a year ago, pushed higher, Realtors say, by the shortage of homes for sale.